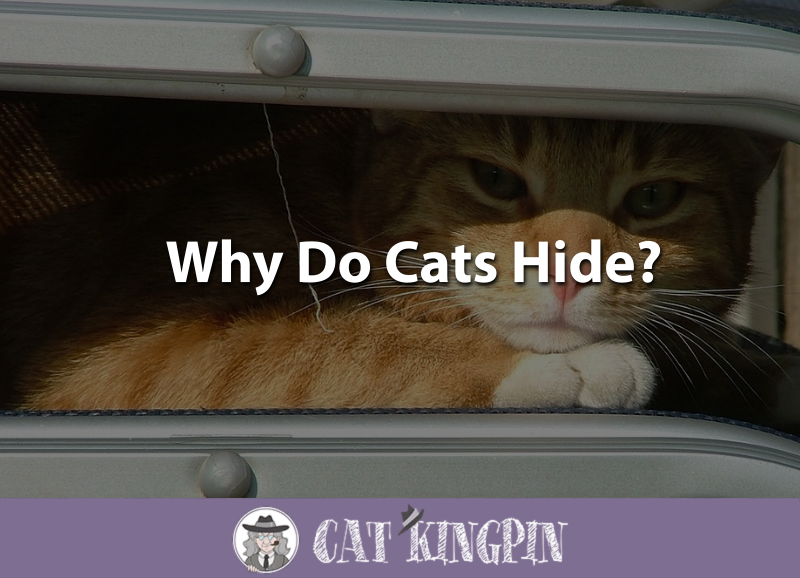 » Why Do Cats Hide? Cats are known for being crafty critters and they’re master Houdinis. How many times have you spent an hour or so frantically looking for your cat, only to find them someplace improbable? You may have even found them scratching a post! Cats hide themselves and their kittens in a variety of places and for a number of different reasons. Where Do Cats Hide Things? Where Do Cats Hide Their Kittens? Where Do Cats Hide in the Rain? Why Do Cats Hide Under the Bed? There are two main reasons why your cat will suddenly “go missing.” One reason a cat will hide is because they are afraid, and the other is because they are seeking out a comfortable and safe place to relax and observe their surroundings. Cats are naturally skittish animals and will run off to hide even for things that we may consider silly (a sudden noise, a knock at the door, a particularly loud sneeze, etc.). However, hiding isn’t just for scaredy cats. Sometimes, cats aren’t necessarily “hiding” so much as nesting. Cats love small, confined, warm places to nap and feel safe, so many times when you think your cat is hiding they are really just relaxing. Cats also have a tendency to observe what’s going on around them in secrecy. They want to watch but not be seen. In fact, the pet industry has picked up on this feline tendency to conceal themselves, and has created tons of different cat trees that are perfect for cats that like to hide away for a while. The Go Pet Club Cat Tree is perfect for cats that like to snuggle away in enclosed spaces, as the base of the structure is hollowed out, creating a perfect little hideaway for your furry friend. If you have multiple cats, you may want to consider reading our review about the best cat tree for multiple cats. You’ll even notice that most cat beds, such as the Tent Bed, are tipi-shaped rather that flat. One again, they mimic that small, warm, and comfortable space that cats crave. You’ve probably been shocked at some of the places you’ve found your cat. You may have found your cats in all sorts of strange places like the bathroom sink, on the top shelf of the closet, or curled up in a shoebox in the garage. Cats tend to hide in small, concealed, and warm areas. Under the bed, in a box, behind the TV, on top of the kitchen counters, and behind the couch are all popular places. If you’re sure your cat is in the house but can’t seem to find them, your best bet is to check small crevices, high-up perches, and snug, warm spaces. Boxes are a particularly popular hiding place for cats. The smaller the better! Cats enjoy the feeling of being surrounded on all sides that a box provides, as it makes them feel safe. This video shows some of the strangest feline hiding places ever, check it out! Does your cat stash all of their toys around your home? Well, there’s good reason for that. In the wild, cats need to hunt, but house cats rarely get the opportunity to do so. To satisfy this instinct, many cats will hide their toys and other small objects, such as bottle caps and hair ties, around the house and then “go find them” later. The danger, of course, is that they’ll forget where they hid them. Which is why when you move the couch to vacuum you sometimes find dozens and dozens of dusty toys (and whatever else your cat got a hold of). Feral cats will hide their kittens for one reason: to keep them safe. Very young kittens are almost completely defenseless. For the first few weeks of life, they are blind, totally dependent on their mother for food, and incapable of defending themselves. When Mama cat has to go out to find food, she will hide her kittens in a safe place to protect them from predators and other cats. Our feline friends retain this instinct and will often hide their kittens even when no danger is present, such as in the comfort of our home. In these cases, the mother cat is likely bringing her kittens to a more relaxing, quieter space. Within the home, cats are most likely to hide their kittens in dark, contained, warm places. Some common areas are behind furniture, inside drawers, in the bed, and in cabinets and closets. 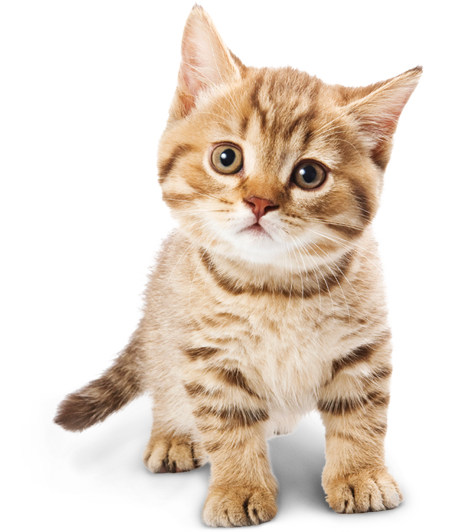 Outside, cats will hide their kittens in concealed areas such as bushes, within sheds, and in tall grass. This cat hid her kittens in a water pipe. Very creative but… yikes! Cats don’t like the water and will often seek shelter when it’s raining. If your cat has escaped and it’s raining outside, you can bet they’ve found a safe and warm place to hide. In any sort of man-made shelter such as a clubhouse, garage, or shed. Your car tires. Cats are very flexible and can fit themselves into even the smallest of places. Cats are well known for seeking shelter in the wheel wells of cars. Any sort of box. Cats love boxes and they provide decent shelter from the rain. The doghouse. If you have an outdoor doghouse your cat may have decided to hide in there to get out of the rain. Cats like small, dark, warm, and enclosed spaces to hide in. And the space under your bed satisfies all of those requirements. Generally, cats will hide under the bed, position themselves against the wall, and watch what’s going on from the safety of their little hiding spot. Sometimes cats hide under the bed as a game. Have you ever innocently walked past your bed in the morning, only to have your cat grab you or scratch your feet and then retreat back under the bed? Cats love to attack stealthily, but in these cases, your cat is likely playing with you and not showing actual signs of aggression. Can I Stop My Cat From Hiding? Hiding is a very natural and instinctive feline behavior, and no matter how safe your cat feels they are unlikely to stop hiding. Making your cat feel at ease and removing any stressors in the home that may be causing them discomfort is a good first step. Providing your feline friend with plenty of cat-friendly places to hide, such as a cat tree or cuddly cat bed, is also a good way to make sure that when your cat hides you’ll actually be able to find them. If your cat is new to your home, they probably just need some time to get used to their surroundings and feel safe. Rewarding them with treats and attention while speaking softly is a good way to begin to gain their trust, as is letting them hide if they feel like it and not constantly running after them. If your cat is hiding excessively you may have a problem on your hands. Or, if your usually-outgoing cat is suddenly hiding all the time, they may be concealing themselves because they are ill. Bring your cat to your veterinarian to rule out any health issues if you can’t find an environmental cause for your cat hiding. Is your cat a master Houdini? Where’s the craziest place you ever found them hiding? Tell us all about it!